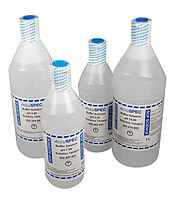 We offer a full range of pH buffers for most laboratory applications. Buffers are traceable to NIST standards and a comprehensive Certificate of Analysis is included. All buffers are certified at 25oC. • Available in various sizes from 500 ml to 20 liters. • Certificates of Analysis include actual concentration, lot number, expiry date, and traceability to NIST, where applicable. • Custom buffers are available, please contact us for more information.